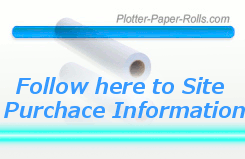 36 x 150′ Plotter Paper is 2″ Core 36×150’RL ..A GREAT American made 36 / 150′ 2″ Core Plotter Media Inkjet Paper . Bulk Volume Plotter Paper information and best quality, lowest price on 36″ X 150′ papers printing here. One searching for the quality 36″ 150′ Paper Rolls of plotter paper are as clean and Bright White Rolls as ever. Plot Printing has never had it so good. We make these in the last American Paper Plants that are still in service, therefore, consider home fresh American made. Keep your family of American hard workers Plotting Paper from Pulp to Inkjet Paper Rolls. This American Plotting Paper fits HP Designjet 500, 510 and all the series of HP since the HP 500. You may not have known, but, America is the Birthplace of Plotter Paper as we use it today. It was 131 years ago in Chicago that Plotter Paper began (as we know it today). Keep America Rolling Plotter Paper to your printer and choose American made. Another fact: all other plottter paper companies all over the world set their standards by America’s 36″ X 150′ Plotter Rolls Paper – so as they said as we were growing up (why mess with the rest when you can get the best here) 🙂 36 X 150′ Rolls to your Printer via UPS and takes an average of 3 days ground from your order to get to get to you. Choose the secret that HP, Canon and other Manufactures already use and know. American 36″ / 150″ Plotter Paper for your printer. Cut out the middle man and order Factory Direct Plotter Paper Rolls today.